I walked down Main street with my yoga bag slung across my shoulder, already sweating in the evening heat. About 6 weeks ago I started taking a weekly yoga class after work. I snuck a peek at my CGM, it read 153, a comfortable number to be starting to exercise. 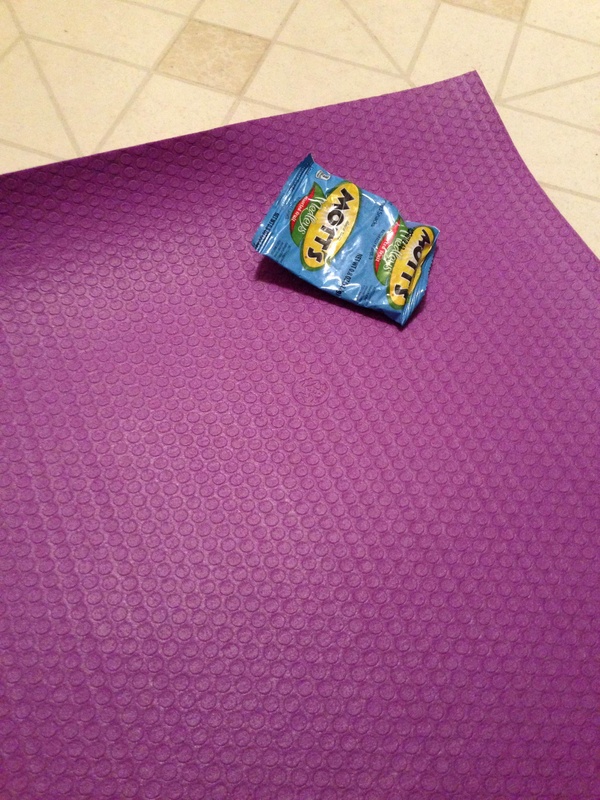 I arrived at my yoga studio and removed my sandals, stuffing my bag including my CGM into the small cubbby and grabbed a pack of fruit snacks just in case of a low. While I’m not new to yoga (my mom is a certified yoga instructor), I have never had much of a consistent practice. My choice of exercise has always been more cardio based: tennis, bike riding, boot camp classes, cycling, etc. There’s always the chance of dropping low while exercising, and it’s happened during all those activities. But there’s enough movement and noise with those exercises that treating a low can often go unnoticed by those around me. I’m not embarrassed to treat a low. I do what I have to do. But at the same time, I don’t like to be disrupted or disrupt those around me. Every time that I made it through yoga without dropping low, I would breathe a secret sigh of relief. It’s just yoga is so quiet, so calm. I don’t want my CGM breaking the silence of a meditative moment or the crinkle of my wrapper interrupting someone’s flow. In the tiny one room studio, mats and bodies lined the floor like sardines packed neatly in a can. I rolled out my mat, careful to leave a respectful distance between me and the woman lying next to me. I set my fruit snacks at the corner of my mat, giving into a brief moment of insecurity where I picture everyone wondering why I have candy out in class. “Just focus on yourself, don’t worry about anyone else.” This is a yoga class after all, let it go. And then I heard it. Buzz Buzz Buzz. Beeeeeep Beeeeep Beeeeeep. That feeling I was experiencing was nothing other than a sneaky low blood sugar. The still silence of savasana was broken by my CGM buzzing and beeping in the background. Even though no one knew those sounds belonged to me, I could feel my cheeks flush with embarrassment. Thankfully just in that moment the instructor began to stir the class back to seated position to end the class. I got up and checked Gigi: 52. I opened and ate the fruit snacks. So I ended up experiencing the diabetic low instead of a yogi high. But it was a good reminder to myself that it doesn’t matter if its the middle of a yoga class or a presentation at work, there are moments when your health is more important. Just as yoga teaches, it’s about accepting what you can’t change and letting go of what you can’t control and instead focusing your energy into living in the now and being your best self.